If you're pregnant, you need the best pregnancy pillow. Why? One major thing that a lot of women struggle with as they move through the stages of pregnancy is sleeping troubles, because of the back pain and joint issues that come with the increased strain and stresses placed on your body. Most of the issues are caused by a lack of adequate support, and if you can correct this, then you solve the issue. Pretty much the best way to do this, if not the simplest, is to grab a body pillow. What Is a Pregnancy Pillow, and What Types Are There? There are three varieties or shapes, and they're all good for different situations. Wedge pillows are the smallest and simplest type of pillow, and like the name says, it's a little wedge that's designed to slide underneath you, to give your body the support it needs throughout the night. Wedges are designed to supplement your natural shape, which is why you might have seen them all over hospitals. As one of the cheapest options available, wedges don't take up too much room and are great for supplemental support, and excellent to prop up your regular pillow, but we wouldn't recommend them as a main pillow. Full length pillows offer much more support, and they're designed to take the place of all of your regular pillows, and more. Full length pillows are great to cuddle, with a flexible, shaped style that's designed to curve around and support your entire body. They're great to cuddle, as well as excellent to snuggle up into and sleep. On top of that, you can use them to sit up with, and they're excellent for breastfeeding. The two general styles of full length are C shape and U shape. C shapes are designed to curve around your body, so you lie with it behind you and enclosing your body, especially your back. U shaped pillows are designed so that you sit in the middle of it, with both arms of the U on both sides of your body. They offer a little more support than C styles, but because you're fully enclosed, they're slightly less adjustable, and a little bit hotter. Removable covers make it so easy to clean, and considering how often you're going to be facing sweaty nights as you go further into your pregnancy, it's definitely something you should be looking for. That's why all of our choices have removable, machine washable covers. You might scoff, but pregnancy does a number on our bodies, and even girls who have never had any issues with allergies can come out in sniffles and rashes from something as simple as duck down. That's why a hypoallergenic filling is the best choice. Different sizes are better for different women, but it's hard to recommend, because it's mostly down to personal preference. Smaller women will probably get on better with smaller pillows, but sometimes being completely swamped and covered all over can feel good too. It's best to experiment. Perhaps try surrounding yourself with pillows, and see how it feels. It's also worth checking how big it is compared to your bed. You partner is probably already making space for you anyway, but adding a gigantic pillow to your bed might crowd him out and make him lose all of his space. How Firm or Soft Is It? Softness and firmness is another thing that comes down to personal preference, and it can change wildly as you go through the stages of pregnancy. Again, experiment. Think about the types of pillows and mattresses you already have, and buy accordingly. Always recommended, for over ten years, Leachco's body pillow is always a winner, no matter the situation. It's a C shape pillow, with a well made, perfectly shaped contour that fits all but the very largest women absolutely naturally. Whether you're a petite little five foot nothing, or closing on six feet, you're going to be able to snuggle up inside this, giving you all the support you need as you go through the stages of pregnancy. Usable in various positions, this pillow is excellent for general use as well as at night. U shaped pillows can be harder to use like this, but a C shaped pillow like this one is ideal to prop you up on the couch or for reading in bed. The cover is removable and fully washable, as well as being soft and comfy because of the 100% cotton construction. Be warned though that the cover is damned hard to get back on, unless you get the zippered version. Apart from that though, this gives any woman, not matter how far along, the comfort she needs for a long, restful night's sleep. If I needed one right now, I would definitely buy this one. Our favorite U shaped pillow, with its huge size and snuggly soft cover, Lavish Home's contour pillow offers all the support any woman could need. The first thing you'll notice with this is how big it is. This is both a good thing and a bad thing. A good thing because it gives you maximum support and allows you to be supported across your entire body, so bad backs and waking up sore is a thing of the past. However, because it's so big makes it an issue for your partner. If you've got a big bed, then you're good to go, but smaller beds with this pillow in are going to crowd out your poor suffering husband. So I hope he likes sleeping on the couch! Bear in mind that this pillow is quite firm, though. Now, I personally recommend this, because once you're used to the firmness, it is so much better. But some people have trouble with it, so it's something to think about. One of the awesome things about this pillow, apart from the comfort, is the washable cover that comes as standard. It zippers on and off really easily, which makes keeping this pristine as simple as throwing it in the washer. If you want a U shaped pillow, this is our top choice. 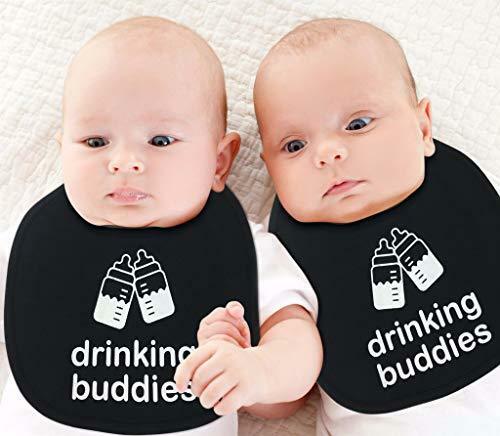 Because of its size, its also really good to sit up with, which makes this great for twins, because you can also use down the line when you're breastfeeding them both. Another U shaped pillow, this one is a lot softer than the Lavish Home pillow, so if you're looking for a softer pillow rather than a hard one, this is a better option. Apart from that, they're pretty similar. Both feature a washable, zipper closed cover which is so simple to remove and clean. It's made from high density polyethylene, which is completely hypoallergenic, resistant to compression and retains fluffiness for longer. This is also slightly smaller than the previous U shaped pillow, which makes this much more partner friendly. You might even both be able to use the same bed if you buy this! Another tiny bonus is that this is really cute, so you'll love throwing it on neutral or white bedclothes and seeing it stand out. One of the big things that make this a recommended pillow though, is the guarantee and return policy. It's hard to know what's going to be comfortable when you're pregnant. Especially with all the changes going through your body. So it's nice to know that you can grab one of these, and if you don't get on with it, just send it back. But I think you'll love it. Our second C (they call it J) shaped pillow, this is a great choice if the snoogle doesn't take your fancy. Hypoallergenic, soft and resistant to flattening, it's incredibly comfortable, and really supportive all the way across your entire body. It's large, but because of the shape it's not oversized for bed use, especially with someone next to you. The white, zippered cover is easy to remove and tough, but simple enough to wash just by throwing into the wash. So why this one rather than the snoogle? Simple. Size. The snoogle is a little smaller, but this is pretty big, which is great for larger women, or just girls who want something with a little more size around them. Plus it's easier to wash, which is nice, because we all know those long nights get sweaty. J pillows are great, and a lot easier to use than U shaped pillow in my opinion, so if you want something that's easy to clean and really goddamn comfy, grab one of these. Whilst we wouldn't recommend a wedge pillow as our first choice, grabbing a little wedge pillow is something I would always go for, because it makes dealing with tiny niggles or supporting the parts of your body that need it most so easy. Whilst wedge pillows are relatively simple, there's a lot to love about this Hiccapop wedge pillow. First off, it's so easy to move and reposition. Larger pillows are relatively hard to manoeuvrer, especially if you're feeling a little less comfortable. But this can be moved in an instant, and fits everywhere. Plus it's really easy to bring with you, whether you're just sitting on the couch and getting some rest or heading out of the house. In terms of support, this is really impressive. It's made of solid memory foam with two choices for firmness, and changing it is as simple as flipping it over. Plus it vents heat really well, because of the perforated foam layer, so you aren't going to overheat with this. For the best support possible, I'd recommend both this and one of the C and U shaped pillows we've already reviewed. It's really the best of both worlds. The design is perfect for pregnant women because it follows the shape and natural contours of the body. It provides comfort and full support. It supports your head, neck, back, and your belly. The unique shape of the pillow can relieve pain, supports the head, and prevent sciatica, which is common in pregnancy. You can also find relief from heartburn and lower back pain when you use this pillow. It also enables you to sit up comfortably in bed. This pillow is made with high-quality materials. The cover is soft and the pillow is thick. You will feel like a baby swaddled because it wraps around you wonderfully and you will get the long and nice sleep that you need. It has a removable cover that is easy to clean or wash. Although the cover is easy to wash, it is somehow quite difficult to put back on. You might have to exert a little bit of effort. If it is too long for you, you might find it a little uncomfortable. Paper-like thin covering the pillow tears easily. This is made with high-quality 7d polyester with soft velvet cover. The filling material is extra soft and high-density because it is made with Bionic-Polyethylene that provides ultimate comfort. The pillow is soft, thick, and fluffy. You do not have to worry that it flattens out easily. It remains fluffy for longer use. It is versatile and functional. The cover is removable and easy to clean. However, some users find one thing that seems to be problematic. When you remove the cover to wash, there is a paper-like cover that holds the pillow together. It is paper-like thin and tears easily. The U shape design follows the natural shape of the body. It offers full support for sleeping on the side, reading, sitting up in bed and watching TV, and even for breastfeeding. Users love its multi-functional design and the comfort it brings. You will be able to get a good night’s sleep with this pillow. It offers full support for the head, neck, belly, sides, knees, hip, and feet. It is also ideal for pain relief when you are suffering from sciatica, leg swelling, and back pain. Using this pillow can help prevent other issues like hypertension, oppression of the liver, and other pregnancy discomforts. We hope you've found everything you need to make your pregnancy as easy and comfortable as possible. If you've got any tips or tricks for other expectant mom's, or any ways to make using the best pregnancy pillow for twins as easy as possible, then make sure you share with us in the comments!